Home / What Is the Function of a Filter Press? What Is the Function of a Filter Press? If you are reading the Micronics Engineered Filtration Group’s blog content, you are probably interested in dewatering. A filter press is an efficient and economical machine for liquid/solid separation. This is the key function of a filter press and Micronics is a world leader in liquid/solid separation. At one end of the machine is the feed head containing piping for the slurry delivery. Crosshead – located at the other end of the machine and contains a clamping mechanism. The Tail Plate – a moving plate – clamps the filter plate pack. The filter plate pack consists of a number of filter plates that form the chambers for optimal solids collection. The Slury – in a filter press operation the slurry is pumped into the chamber and against the filter media. The Filtrate – the liquid passes through the filter cloth and exits via the filter plate’s filtrate ports. The Solids – often referred to as the filter cake – collect on the surface of the filter cloth within the chambers and do so until the chamber is full. The cake may be washed or blown-dry to achieve optimal filter cake dryness. The filter cakes are then discharged and the filtration cycle is complete. Micronics filter presses are available in fully automated models, semi-automatic models, and manual models. The filter plate closing mechanisms are typically powered by electro-hydraulic or air-over-oil hydraulic power packs. Your slurry-type may dictate the type of power pack needed and Micronics will assist you in determining the optimal power pack for your application. 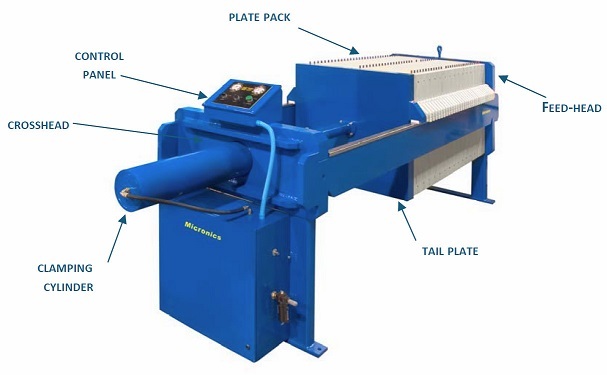 As you would expect, Micronics’ filter presses are rugged, robust, heavy-duty fabrications and manufactured to precisely-align and evenly distribute the clamping forces required to counterbalance the forces generated during pressure filtration. All of our filter press designs are ideally suited to the rigorous conditions encountered in filtration applications, including yours. Did You Know that Micronics maintains an inventory of in-stock, ready-to-ship filter presses ready to meet your dewatering challenges now? In-stock capacities include ~7 cubic feet, 16 cubic feet, 25 cubic feet, and 100 cubic feet. Learn more here. Whether you are a brewery, concentrator of zinc or copper, a pigment manufacturer, or in chemical manufacturing, Micronics has the innovative, high-performance filter press solutions for your industry. Contact us to discuss your next filter press project.